Day 2 of the U23 World Championship saw the rain come in, keeping many of the previous days 6,000 crowd away, and resulting in the moving of the Stone of Strength to the final Day. 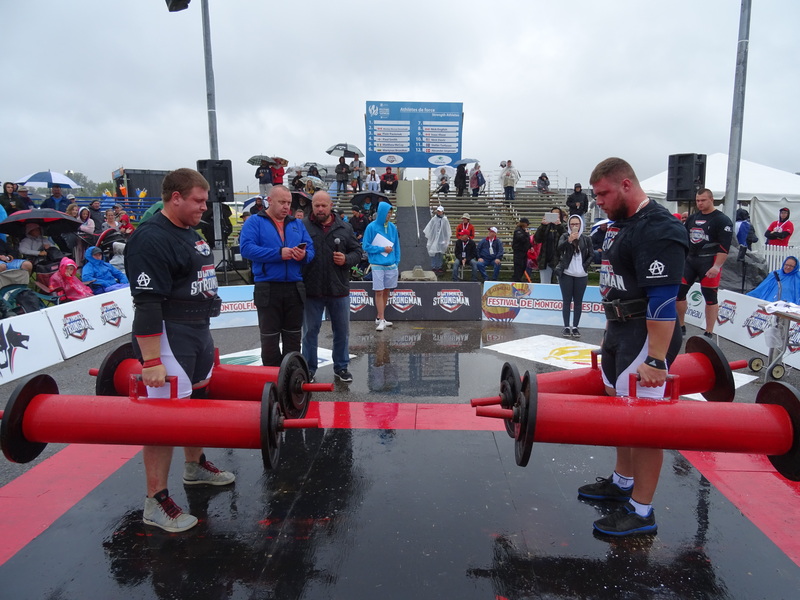 The 2 x 150Kg Farmers Deadlift Hold was the first event, and the first due out were Denmark’s Alexander Jorgensen (10th Overall) and the USA’s Nick Davis (8th overall). Davis was the first to drop, at 22.42 seconds, whilst Jorgensen dug deep to record 36.47 seconds – enough for 8th place in the Farmers hold. Icelander Stefan Torfason (9th Overall) was matched next with Canada’s Nick English (5th Overall). 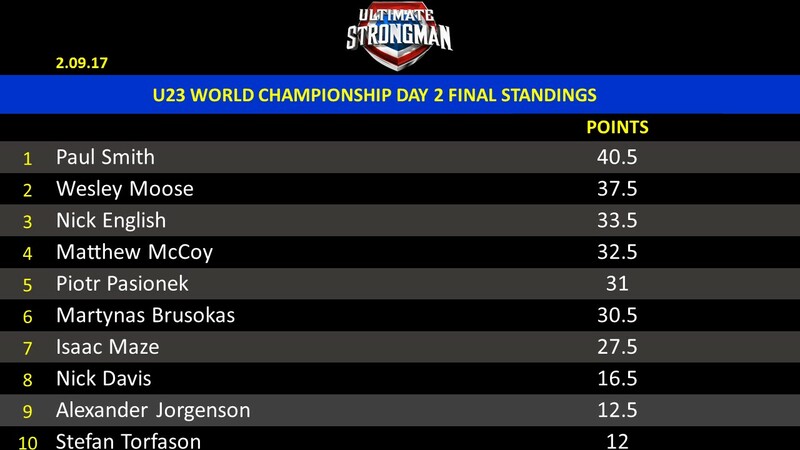 English had been leading after the 2nd event on Day 1, but a disappointing arm over arm truck pull had dropped him down to 5th overall. Torfasn was first out – 41.30 seconds his time, but English zoned in and became the first man to record over a minute – 67.01 seconds his time. Canada’s Isaac Maze (7th Overall) and Martynas Brusokas (5th Overall) followed. Brusokas went out early as his straps went, his time just 24.28 seconds. Maze got in the zone and had the crowd roaring as he put in a competition best performance to notch up a staggering 94.03 seconds. He had set the marker for the rest of the field to beat. Perhaps the most eagerly awaited match up was between Ireland’s. Both men got to work, and the timer passed 2 minutes the crowd were on their feet roaring the duo on. McCoy, who is one of the worlds best at hold events, shouted encouragement to Smith, before the Englishman finally dropped at 129.18 seconds, surpassing the previous junior world record by over 9 seconds. 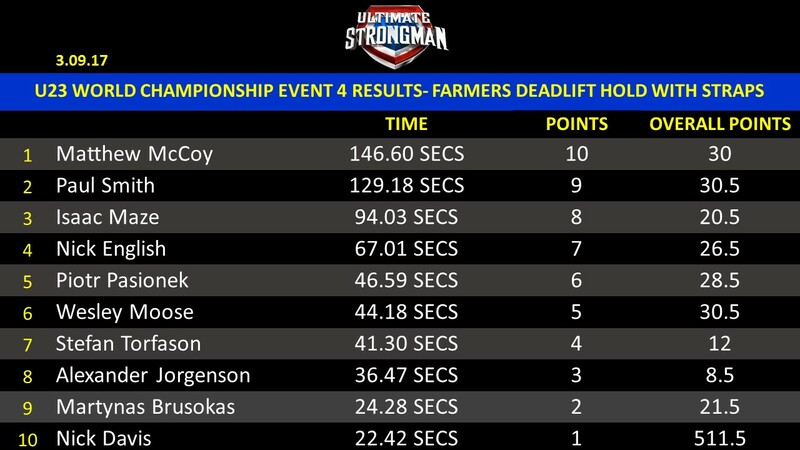 McCoy carried on, his hands and arms now numb, and even had the time to smile at the camera before he finally succumned at 146.60 seconds – a new World Record. The last pairing was Competition leader Wesley Moose (Canada) and Piotr Pasionek (Poland). Moose held as long as he could, but suffering with a bicep injury he wisely dropped early to save himself for the rest of the Championship. His time, 44.18 seconds, good enough for 6th overall, Pasionek posted 46.59 seconds, which earned him 5th. 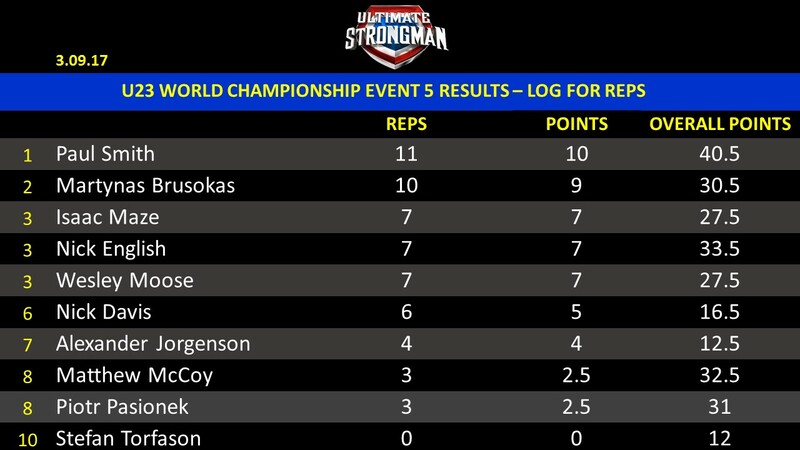 The final event of the day was the Log for Reps (115Kg). Paul Smith continued his run of form as he smashed out 11 reps for the win, just ahead of Martynas Brusakas with 10. Full results below.